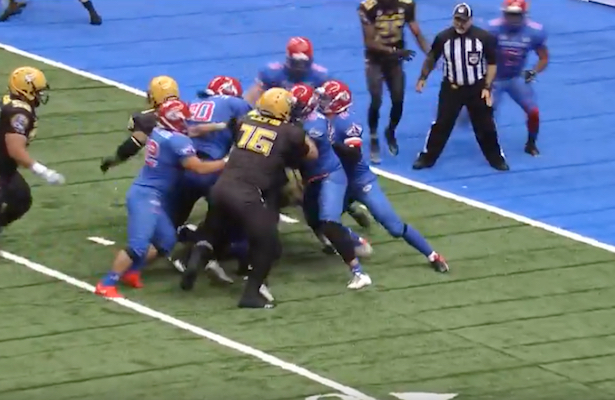 The last time the Beijing Lions and the Qingdao Clipper went head to head it was the first ever match up of undefeated teams in the China Arena Football League. So what can we expect in the China Bowl as the China Arena Football League will crown its first champion? Most likely a game that will go down to the wire. In the first half in the October 16 meeting in Qingdao, the Lions Luke Collis threw three touchdown passes to Collin Taylor and a pair to James Romain. Clipper QB Bryan Randall did find Xavier Boyce for two scores yet Beijing led 35 to 13 at the half and you might have turned your TV off right there. If you did, you missed a game that would not be decided until the final minutes. Taking games down the wire has become a hallmark of Rod Miller’s team. In the second half the Clipper caused two turnovers to get back into the game. After Randall hit Reggie Gray with an 18 yard TD pass, the Lions Rustin Mayorga crossed the goal line from a yard out and Beijing’s 21 point lead looked secure. The comeback continued as Randall hit Jason Holman with an 18 yard scoring pass and on the ensuing kickoff the Lions Torez Jones fumbled. The ball was recovered by Sean Brackett and seven plays later Tian Chu Zhang’s touchdown reception put the Clipper down by one score. The Qingdao defense was not finished as on the next series linebacker Jake Metz pressured Collis into an incompletion and then recovered a fumble on the proceeding play. The Clipper were just eight yards from tying the game but this time the Lions held and took over on their own six yard line. Beijing picked up three first downs on their last dive and the final 19 yards saw Collis passing to Romain for his third touchdown catch of the game and the final points as the Lions held on for a 47 to 33 victory. Since that time Beijing has had two relatively easier games with a 45 point win over Dalian and a 23 point victory over Guangzhou. The Clipper has continued to play it down to the wire with a 51-49 win over Shanghai on a last second field goal and then losing by seven to Shenzhen. In the loss to the Naja, Qingdao wide receiver Reggie Gray was about to tie the game on a 36 yard pass play in the final minutes. One yard from the goal line Shenzhen defensive back Tristan Purifoy stripped the ball and recovered it in the end zone. That allowed the Naja to run out the clock and win 47 to 40. The CAFL just might be the best “reality show” on TV as the unscripted endings have provided viewers with entertainment and excitement. The China Bowl should be no exception.